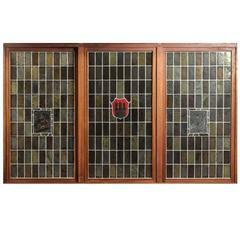 An antique Aesthetic Movement mosaic transom window features leaded stained and jeweled glass design with central medallion having hand painted bird (Swallow) and insect in flight, circa 1870 Measures: 19" H x 48" W x 2" D.
Huge German stained lead glass window with motifs and city coat of arms from Hamburg. 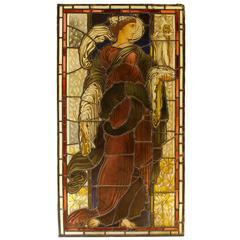 A very beautifully detailed and designed window, this piece truly shows the craftsmanship of the late 19th century. 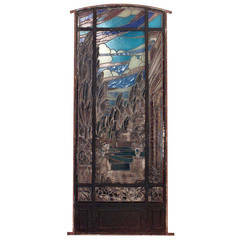 19th century iron framed stained and leaded glass window with an architectural and landscape scene beneath an arch top. 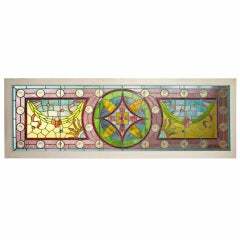 Four American Victorian stained and multicolored leaded glass window panels with 16 square pink and blue panels in wood frame (Priced each).